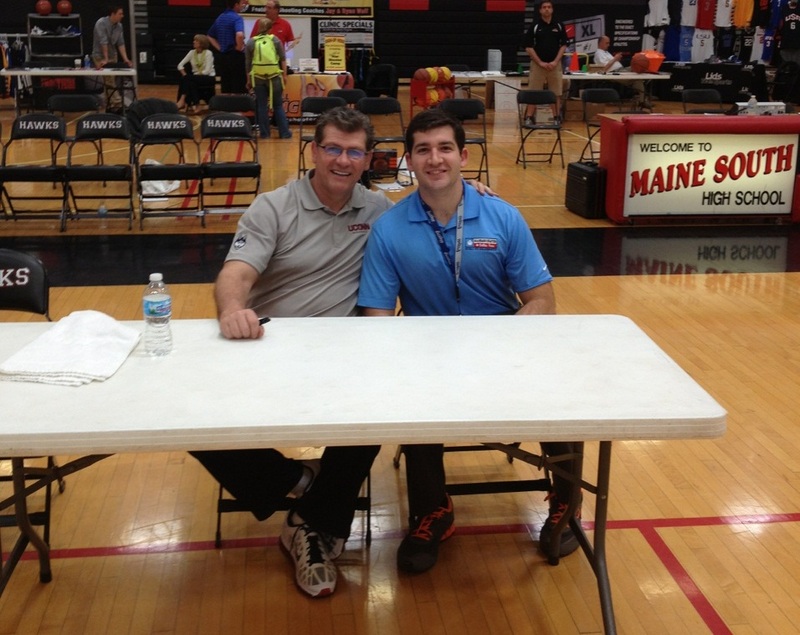 Leadership Consultant Bill Morosco with UConn women’s basketball coach Geno Auriemma. University of Connecticut women’s basketball coach Geno Auriemma has won over 800 games at the college level – eight National Championships and fourteen Final Four appearances. Though Coach Auriemma is most known for motivational and recruiting skills, his success on building championship teams has also relied on his talent for teaching his players to be leaders. I had the opportunity to meet and learn from the legendary University of Connecticut coach earlier this spring at the Nike Championship Basketball Clinic in Chicago. While the clinic focused on the fundamentals of coaching basketball, the sessions also gave me a chance to observe up close how Coach Auriemma teaches leadership and gets the most out of his teams. Be a People Person. Coach Auriemma said that one of the most important keys to his success is being a people person. You have to understand what motivates each individual person and how to harness that inspiration to get them to do what’s best for the team. The same holds true for fraternities and other student organizations. All of your members have different strengths and motivations. It is your job as a leader in the chapter to understand your members’ motivation and to cultivate those desires to help them reach their personal goals as well as the chapter’s group goals. Be Realistic. Coach Auriemma says “It doesn’t matter how many plays you run if your players can’t shoot. You still won’t score.” You need to understand your situation and limitations and decide what a realistic vision of success looks like. A leader needs to know what his or her team is capable of. It might be unlikely that your chapter can produce weekly alumni newsletters if your chapter has never created one before. Set goals that will improve your chapter but make sure they are attainable. This will build confidence and keep the chapter moving towards bigger and better things instead of causing frustration and low morale by failing to reach an unrealistic goal. Treat People Equally. Auriemma believes in treating his players equally. He has his forwards and centers do the same dribbling and shooting drills as his guards to build a more diversified offense and to improve each player’s skill set. Treating team members equally is important for a fraternity. Give each chapter member/officer the same set of expectations. If a 3.0 GPA is required to be an officer in your chapter, why not make it a requirement to be a general member in good standing? This will help hold your members to a higher yet achievable standard and better improve the entire chapter. Constant Gentle Pressure. Coach Auriemma described his approach to the yearly development of each of his teams as constant gentle pressure. Similar to Coach Knight, Auriemma ups the ante in every practice, making each session more challenging than the previous one – all while making sure the drills are relevant to the team’s mission to play championship basketball. At the chapter level, this concept can be used to get the most out of all officers and committees. If committee deadlines are strictly monitored and constantly enforced, chapter officers will be ready for greatness when it’s time to complete Pursuit of Excellence documentation and award applications. Do Everything at Game Speed. During practices, Coach Auriemma has his players do every drill with the same speed and intensity that they would do in a game. This increases the focus, effort, intensity and results of each practice and makes the game just as hard if not easier than practice. 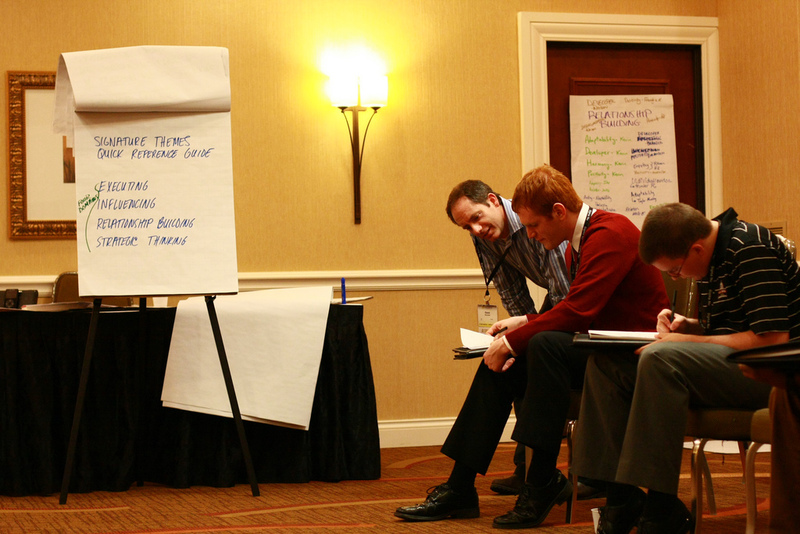 Have your officers run their committee meetings just like they would a chapter meeting. This way chapter officers know exactly how to present in chapter and committee members better understand their role in the larger meeting. Own What You Teach. Auriemma also talks about the flaws in trying to teach things you don’t fully understand. If you don’t fully understand the topic, the first question when adversity hits could derail the entire operation. Become an expert, study and learn how to apply what you want to teach in every situation. Similarly, if you find an idea you really like in the Best Practices Library, be sure to reach out to the chapter that created it to ask questions to fully understand the material. If your Leadership Consultant brought up a great idea during his visit, follow up with him to get additional advice on implementing the new approach. Have Contingency Plans. For the NCAA Tournament or other conference tournaments, Coach Auriemma likes to plan as if what he wants to do won’t work. For instance, Auriemma is known for drawing up three different ways to start each play, just in case the first approach doesn’t work. At some point, something you wanted to do – be it a social, philanthropy, or chapter retreat – won’t work. So always have a backup plan. Faculty member Dave Mainella works with chapter presidents during the 2012 College of Chapters in St. Louis. Imagine as many as 60 entrepreneurial college students living under a single roof and being mentored by successful professionals in their chosen fields. That’s the idea behind a social living project called co.space in State College, Pennsylvania. Working with more than 50 student interns from Penn State, New Leaf built the framework that will serve as a model for other universities interested in the project: a two-year program for juniors and seniors that includes a semester of training, the opportunity to lead a semester-long project, a summer internship, and a personal mentor—plus a plethora of professional networking options in-house. It sounds awfully familiar, doesn’t it? What are some ways fraternities could collaborate with GOOD or co.space on a similar project? The first thing I do during the course of my change-agent work for Fortune 100 companies is to establish the 4:30 rule. The maximum number of people in any meeting should be four, and meetings should never last any longer than 30 minutes. No phones allowed. You may think this a little radical but, if you want to act entrepreneurial, then these are the most important steps to take. If you’re able to get the right people into one room over two days, the stage is set. Make sure the room is far from the office and prep everyone on the notion that it’s essential to not only come up with ideas for change, but actually lock them in by the end of the second day. If the incentive is great enough, and everyone’s prepared to roll up their sleeves, in my experience, it will happen. Do yourself a favor and set aside 5 minutes to read the full story. How could you apply Lindstrom’s other ideas to your chapter? While your chapter was designing this year’s recruitment t-shirt (another beer logo, of course), my chapter was having lunch with prospective members and their parents. While your chapter was creating demeaning nicknames for each pledge, my chapter was taking the time to learn each candidate’s name, hometown and life story. While your chapter was debating what embarrassing costume each pledge should wear for this weekend’s party, my chapter was helping each candidate set personal goals for the semester. While your chapter was out buying family drinks for Big Brother night, my chapter was arranging a mentoring program for each candidate to work with an alumnus in his field of study. While your chapter was holding the weekly line-up in the basement to grill pledges on arbitrary questions they can’t answer, our brothers were at the library studying with the candidates (our candidates learn Fraternity history from the brothers). While your pledges were out stealing road signs, defacing property, and breaking into campus buildings during the annual scavenger hunt, our candidates were listening to a guest speaker talk about time management skills and effective study habits at our weekly chapter meeting. While your pledges were running errands and performing arbitrary tasks to complete their interview books, we were hosting a parents’ dinner to learn more about our candidates and their families. While your brothers were harassing pledges in front of their dates at last weekend’s mixer, our chapter was hosting an etiquette dinner with the top sorority on campus. While your chapter was trying to coordinate manufactured stories for the upcoming “nationals” visit, my chapter was updating our strategic plan to free up time for feedback and guidance during the leadership consultant’s visit. While your members were swapping stories of drunken female conquests from the previous night, my chapter was hosting a campus-wide program on preventing sexual assault. While your chapter accepted mediocrity, we sought excellence. While your chapter slowly fumbled everything away, we gradually earned our way to the top. And while your chapter looked for someone to blame, we resolved to reach for the next level. 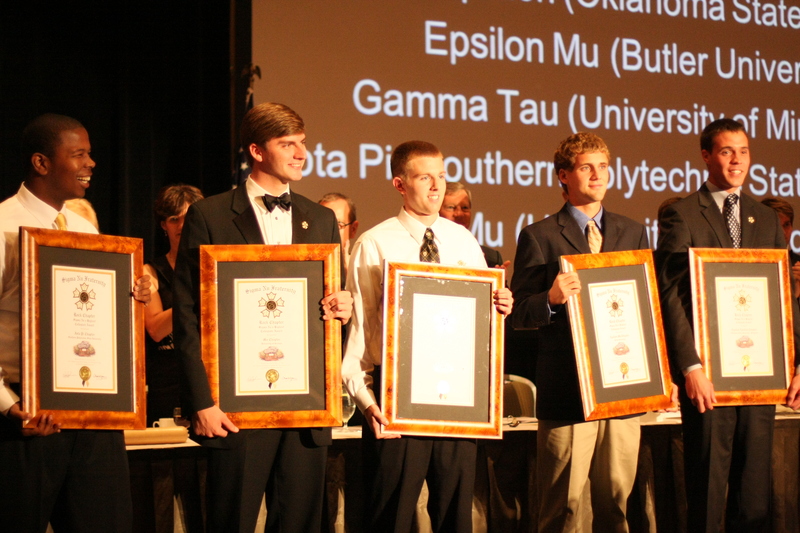 Rock Chapter recipients proudly display their awards during the 64th Grand Chapter in Boston. The results fascinated and delighted the city officials. In the vicinity of the schools where the dynamic displays were installed, drivers slowed an average of 14 percent. Not only that, at three schools the average speed dipped below the posted speed limit. The signs leverage what’s called a feedback loop, a profoundly effective tool for changing behavior. The basic premise is simple. Provide people with information about their actions in real time (or something close to it), then give them an opportunity to change those actions, pushing them toward better behaviors. They are in fact powerful tools that can help people change bad behavior patterns, even those that seem intractable. Just as important, they can be used to encourage good habits, turning progress itself into a reward. In other words, feedback loops change human behavior. 1. Post the grade for every exam on the wall above your desk. 2. Track the number of hours you spend studying vs. playing video games (or whatever variation suits your work vs. leisure habits). Post the numbers in a place where you’ll see them throughout the day. 3. Tally the number of minutes your chapter spends discussing social events vs. philanthropy planning or LEAD programming and post in a central location in the chapter home. Ask the chapter – what do these numbers say about our chapter’s priorities? 4. For the wellness-inclined, track the progress of your workouts and post them in your kitchen. Use the comments section below to share some other ways your chapter could employ the idea of a feedback loop. As the article notes, the more effective feedback loops rely on automated data collection (such as Your Speed signs or other automated sensors). Still, feedback loops present an innovative opportunity to help chapters change negative behaviors and encourage good ones. The full story is a must-read. Pandora, Groupon, LinkedIn, and coming soon to a portfolio near you: Facebook. If you’re a business major or just generally someone who keeps up with business news then you’re well aware of the recent scramble of tech companies to the IPO cash cow. Just the other day, Facebook was given a valuation estimate of $100 billion. These companies are searching for capital, which will hopefully result in both a better product and higher profits. However, these companies also have to prove their worth both literally and figuratively. That’s what the stock market is all about, isn’t it? Is Company A worth so-and-so amount or is it not? Product recalls, poor leadership, bad money management, and failing to achieve benchmarks will result in a dropping stock value. On the other hand, the opposite of these negatives will attract confident investors eager to throw some money your way in return for an anticipated increase of value. All business talk aside, isn’t this a rather nifty metaphor for a fraternity? If I run chapter A and we have strong leadership, a strategic plan, defined goals, rock solid dues collection and budgeting, and of course providing the best fraternity product on our campus then why wouldn’t others want to “invest” and join us? For a nice cherry on top of this sundae we also mention that those who invest with us will see an increase of value. With each bid signed and an additional investor we can use that capital to fund brotherhood retreats, run an effective LEAD program, host safe social events, and the added bonus of developing as a scholar, leader, and gentleman. Now let’s say I run chapter B and we don’t have a very organized group of leadership, we’re in debt because we don’t collect dues very or bother to follow a budget, we don’t have any goals (which means we’re either in neutral or sliding backwards), and our overall product is mediocre at best. In fact, to hide our downfalls we like to throw up the smoke-screen of parties and the image that everything is A-Okay (Sounds like Enron might have pulled a page from this playbook, actually). But then we had an incident thanks to our risky social practices. Now we’re wondering why no one wants to sign a bid and invest in us (or why we’re only attracting people who want to party). Millenials are smarter than your average bear. If anything, to follow the running stock market metaphor, they’re smart bulls looking to invest in something that is going to provide them value for the capital they invest. So as you enjoy your summer vacation and reach that point of excitement to return back to school to see brothers and rehash your summer exploits, think about your answer to two simple questions: If your chapter were to launch as an IPO what would it be worth, and would it ultimately boom or bust? On Tuesday, the NCAA released its list of academic overachievers, and Butler was the only team among those that reached this year’s championship round in Division I football, men’s basketball or women’s basketball. Butler could have repeated their version of the we-go-for-quality-not-quantity narrative (e.g. “we can only recruit athletes OR scholars, not both”), but they didn’t. Excellent basketball programs–and excellent chapters–don’t make excuses, and certainly not the quantity vs. quality excuse. Look at our most successful chapters: they earn top GPA rankings AND win intramural champions; their chapter size is double the average AND each member outperforms his non-Greek counterpart in the classroom; they are the most respected group on campus AND they actively confront hazing. It starts with an attitude–the realization that it’s possible for quality and quantity to increase in tandem. There are too many counterexamples to believe otherwise.